Jaya Gouranga Dasa : I traveled with Srila Prabhupada to Mexico and there he was kind enough to give me first and second initiation at the same time, because I had been waiting since I joined in 1970. 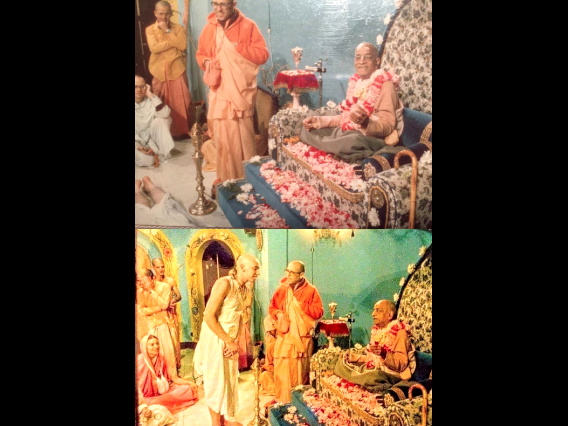 When Prabhupada was about to give me my name, he was looking at me very intensely for about 20 seconds, and then he said, “Your name is Jaya Gouranga Dasa.” I didn’t understand what he said but I said, “Thank you Srila Prabhupada,” and I threw myself at his lotus feet to pay dandavats and as you can see in the picture I’m sending you, where you can see my legs on the floor paying dandavats and Prabhupada was laughing as well as everyone else because as I was paying dandavats. Srila Prabhupada said, “He looks like Gouranga,” and that’s why he and everybody else laughed. I say Prabhupada was seeing Gouranga everywhere and was much too kind to say that about a wretched, fallen conditioned soul like myself. All glories, all glories to our Divine Jagat Guru Srila Prabhupada.